Nothing beats the chill better than a hot bowl of soup. Soup is economical, easy and very nutritious. It is also a great way to use up leftover meat and vegetables. Keep your pantry stocked with cans of different types of beans, rice and canned tomatoes, typical staples of soup. Homemade stock tastes better then canned and has a lot less sodium. Here is my homemade turkey stock recipe. I gave the traditional turkey soup an ethnic flair by adding the fragrant spices of India. Like all soups, this tastes even better the next day. In a large deep soup pot add some olive oil. Over medium heat add the onion, garlic, celery, peppers and carrots. Cook until softened and translucent. Add the lentils, rice and spices. Stir until well coated and mixed. Add the turkey stock and rice. 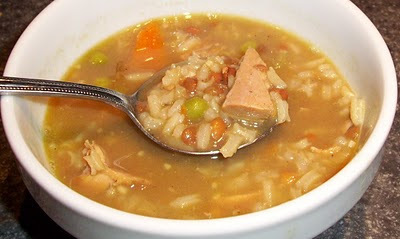 Bring to a low boil, reduce heat and simmer for 1 to 2 hours until rice is tender and soup is reduced slightly. Add the peas and turkey during the last half hour of cooking. Season to taste with salt and pepper or more spices. Ladle into bowls and serve or refrigerate and reheat and serve the next day.